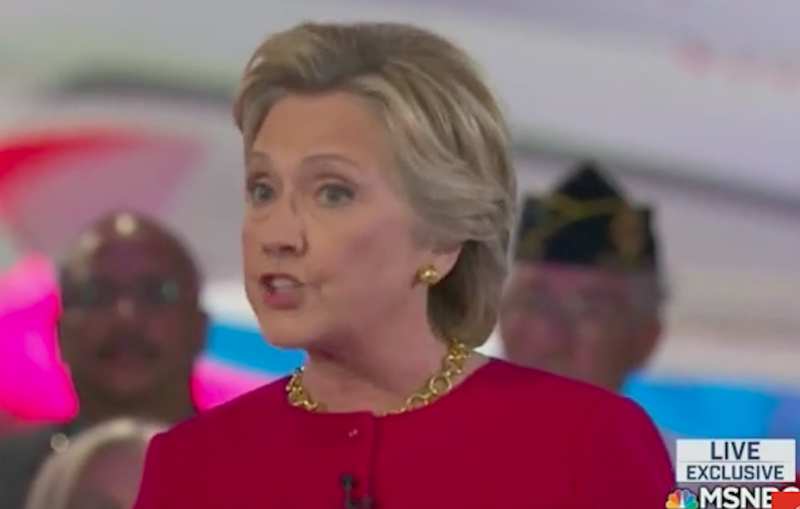 During NBC’s Commander in Chief forum Wednesday, as Hillary Clinton defended her decisions regarding military intervention she claimed no Americans died in Libya. False. Clinton ignored nearly 600 requests for additional security and concerns about the safety of the consulate from U.S. ambassador Chris Stevens, who was later killed in Benghazi. House Republicans investigating Clinton’s Benghazi decisions say she pushed for Americans to stay there even though other countries’ diplomats had fled due to an increasingly hostile environment. They say Clinton did so because Libya was to be her signature achievement as secretary, and she jeopardized American lives in a failed attempt to hold it. This isn’t the first time Hillary Clinton has said something totally insane about Libya. During a Democratic townhall in March, she again claimed that “we didn’t lose a single person” in Libya. She has also tried to depict American involvement in Libya as a mission that has brought democracy and stability to the region. After the Benghazi attack, the situation in Libya has spiraled out of control. The country is now a stronghold for ISIS, and fighters belonging to the terror group have been spilling over into neighboring Tunisia.